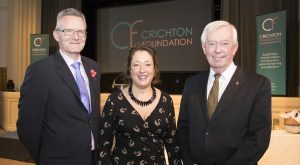 On Friday 9th November the Crichton Foundation welcomed two hundred and twenty-four guests to the Foundation’s first ever autumn Lunch. Over the last eighteen years a variety of autumn functions have been held. Balls, galas, ceilidhs, jazz and opera nights have all been successful fundraisers however, the time was right for something (not completely) different. 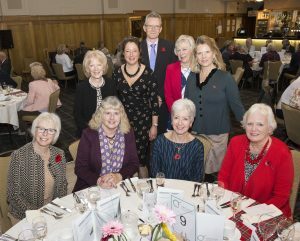 The Women of Dumfries and Galloway Lunch held in March follows a tried and tested formula. There have been many suggestions over the years that such an occasion might be enjoyed equally by the men of Dumfries and Galloway as the women. 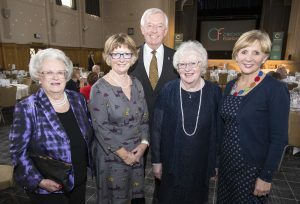 The Crichton Foundation Lunch has therefore, become the autumn fundraiser, following the same format as the Women’s Lunch in the spring. The Foundation has an important role to play in raising funds for the development of educational opportunities and continues to offer help to students across the Campus. Every penny raised from the Lunch will go to the students of the Crichton Campus and their institutions. Awards are made to both students in financial difficulty and those who excel in their studies. There are also special prizes for exceptional students, and the Sir David Landale Prize was presented to the 2018 winner by Lady Landale at the Lunch. 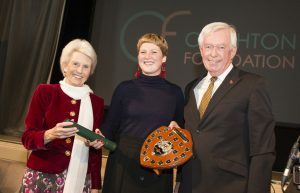 Leonie Lepple is a very worthy winner of this prestigious prize. We have received a lot of very positive feedback from the event. 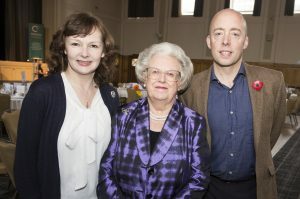 The speakers, who reflected two of the nation’s passions, the love of antiques and the love of gardening, were particularly well received. The final figures have yet to be confirmed however, the total raised from this year’s lunch will be just over £10,000. The Foundation is obviously delighted with this total, which will make a real difference to the students here. This is only possible through the support of everyone who purchased a ticket for the event, businesses that bought advertising in the event programme and those who made donations of gifts for the prize draw or of monetary payments. The Foundation is very grateful for the support from each and every person or company who took the time to be involved. Thank you.